The term “egress” refers to a building code that is related to the capability to be able to leave a room in the case of an emergency like a fire. Similar to a window you’re accustomed to seeing on a home, these windows will have a well dug outside of it, which is large enough for an occupant to escape in case of an emergency. Typically found in a basement bedroom, this type of window can help solve fire codes and/or offer a variety of other perks such as allowing natural light in. For just the egress window, without any installation factored in, the costs can range from $250 to $1,000+, depending on the brand and the type. Home Depot, for instance, offers a variety of egress windows, with its best sellers selling for $200 to $400+. Aside from the window, you also need to factor in the well, ladder and the well cover, which can often bring the costs of just the materials to about $1,000 to $1,800 for a set, in addition to the aforementioned window costs. As you can see, there are multiple factors which can often affect the price, meaning it can be hard for us to pinpoint an exact price for your project. For this very reason, we highly recommend you use the free quote comparison tool, HomeAdvisor.com. With this tool, you simply explain your job and licensed contractors in your area will contact you with a quote for free. No credit card is required and it’s extremely easy to use. On this BiggerPockets.com forum thread, for instance, members talked about what they paid for an egress window install, with prices ranging anywhere from $2,000 to $4,500. Type of window: As we explain below, there are a variety of egress windows available, and the costs can greatly depend on your choice. A standard 30-inch sliding egress window, often the cheapest choice, can be much cheaper than a swing-in type window. Premium windows, which are often considered to be much more energy efficient can cost even more but you could see energy savings in the future. Location: How much effort is involved in the install? If you’re looking to replace an egress window with a similar window, then the job will be much easier, but if you’re looking at a foundation that has no egress window, then this could be much costlier as you will need a structural engineer to check out the foundation and a lot of excavation work will be required. On top of this, utility lines need to be marked and permits need to be pulled. Excavation: In terms of the excavation portion, how much work needs to be completed? Not only will this excavation create a safe place to escape, the contractor will also want to make sure the area surrounding the window is draining naturally, away from the home. For larger jobs, additional equipment may be necessary, further increasing the costs. Escape system: A well escape system, as part of the egress window, will be added for safety. This type of system is designed to be either equipped with steps or a ladder to help with an escape and depending on the setup, this can cost another $1,000 to $2,000. Well cover: A well cover, designed to cover the well and window, can help prevent accidents and the buildup of water and debris. While optional, these covers can cost another $400 to $800. Permits: Most of the time, you will need a permit to begin and complete the job, with the average permit, depending on your location, costing about $150. As the egress window installation process often requires much more work than a traditional window, this is the reason why a permit needs to be pulled. Warranty: For many window manufacturers, the warranty is limited, but can often be extended for a longer period for an additional fee. Marking utility lines: A professional will need to be hired in order to have utility lines marked. Hinged casement: A casement egress window is designed to swing open or can crank outward and is considered to be one of the simplest options to install if you were to hire a contractor. Most of these windows are usually made of fiberglass or vinyl in part to the low-maintenance requirements and if you consider this option, you will need to have a large enough of an opening inside of the window well to brace for both the window and the person trying to exit. Horizontal Sliding: Larger windows designed for a larger opening, the horizontal sliding egress windows are usually considered for a larger room due to the amount of sunlight it’s able to bring in. 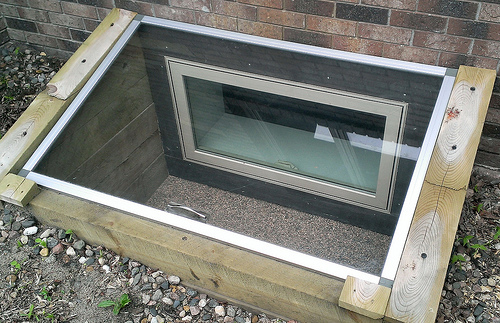 As the name implies, this egress window is installed on a horizontal track and will bolt in the middle. Single or Double Hung: Whether it’s single or double hung, they almost look the same from a distance, with the only difference being in the sash. The double hung window can be lowered or raised, making it easier to clean, while a single hung egress will be fixed at the sash, only tilting out at operation, making it harder to open. NOTE: These are typical codes but can vary from region to region. Be sure to check with your local municipality to for more information. An egress window is an excellent option for a basement, especially if you’re concerned about safety as an occupant now has an escape route in the case of an emergency. Regardless of which option you choose, an egress window has been shown to help increase the value of a home as long as tastefully done and installed properly. Properly insulated windows will not only allow natural light into the room, but it can also be insulated well enough to keep the rooms efficient. Like a lot of window types on the market, an egress window can come in many styles and colors, often making it quite easy to find one that suits your tastes or match your current home’s decor. A basement without windows can often create a stale environment, but as egress windows can open, this can help circulate the air during the cooler days. If you’re considering this option for an existing home, the install process can be much more than a traditional window install due to the excavating, clearance, utility inspection to avoid destroying lines and the permits that need to be pulled. The whole install process for an existing home can often be a headache due to the multiple contractors you need to hire, including structure engineers, to ensure the window is installed up to code. Failing to hire the right contractor who does a poor job of installing the window can cause leaks during a heavy rainfall. Also, without the proper drainage, the window can trap the water, allowing it slowly leak into your home over time.